I’ve debated writing this confession for a few minutes now (because that’s about how much thought I put into things these days), and while the side of me that wants people to think I’m pretty level headed didn’t approve of the binge sharing, I figured everyone I care about already knows my crazy, irrational side. I think it all started when I was about 7 years old. I was always frail looking as a child. My mom said it was due to my large amounts of meds, but I think it had more to do with my love for ice cream and popcorn, and the lack of interest I felt toward any other food groups. In any case, my sister and mother were working out to Richard Simmons’ “Sweating to the Oldies”, and I wanted to join in. I remember thinking Richard could help me build some quick muscle and forgo my skanky Courtney Love vibe, but there was one MAJOR issue. You see, I had a huge tin of popcorn in my grip and I was never one to abandon a perfectly good batch of popcorn. The popcorn tin was adorned with Christmas bears, and housed three separate sections of cheddar, caramel, and butter flavors. Despite the epic trifecta of popcorn variety, I was a fan of the basic butter. However, I occasionally slipped into the caramel triangle when I felt a little spicy. Here I was, seven, eager to have abs, and in a trance with this wild man’s tight shorts and fro. Yet, I felt this deep, uneasy feeling with the thought of leaving my beloved popcorn tin behind. I also had a magic handful of butter popcorn with three random caramel specs already prepared and ready to be indulged. I liked eating them with my eyes closed and being surprised at which flavor snuck in. So, I did what any rational person would do in the face of such a life altering dilemma. I worked out while one hand remained wrapped around the large teddy bear tin, and snuck handfuls of butter in my mouth when Richard declared water breaks. That one moment in time pretty much sums up my view on life… or at least my mantra for a healthy lifestyle. Eat what you want. Work out to balance it all out. 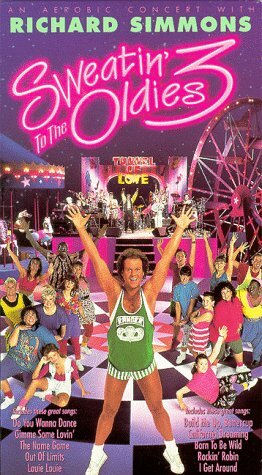 Also, I can never see Richard Simmons, teddy bears, or popcorn tins without immediately being emerged in that day on Hodges Lane with my sister and mother dancing in spandex in our living room. I still see the Saint’s fleur di lis wallpaper, the only valid stance my father ever made, as if I’m looking at a still depiction or photo from that very day. These days though, I do things a little differently. The most frustrating part about this whole inner fat kid bit is that I actually really pride myself in being healthy. For instance, I really do love KALE and find its recent hype totally valid. I don’t eat much red meat, I never drink carbonated drinks, I love running, and yoga, and ugly, green smoothies, I don’t eat processed foods, and I think hormones are the scariest things to ever be injected into poultry. I mean, for the most part – I keep myself in check. THINGS START TO GET CRAY CRAY. And once I’ve broken the seal of unhealthy eating for the day, ALL HOPE IS LOST. Perfect example, a few days ago I decided I wanted to pair my normal bourbon with a coke. But not just any coke. I wanted the Christmas one, because Santa and his fluffy white beard were practically begging for me to indulge, and urging me to remember cold nights at my Uncle Eugene’s playing video games and telling ghost stories in the creepy upstairs apartment. So, I bought a pack of cokes, but not just any normal size pack of cokes. I bought the massive 24-pack. The one that only people who are edging the line of diabetes buy. The one people purchase for house parties. THE ONES THAT MAKES 32 OZ FOUNTAIN DRINKS LOOK LIKE A RAIN DROP. I’ve got no boundaries man! Now, I’m stuck staring at these little beasts everyday. I keep grabbing one from the bottom drawer in my fridge, popping the top with a powerful “CLICK”, taking a sip, and hating myself the whole while the acidic liquid burns down my esophagus and into the top of my belly. Then, as soon as the glorious realization of the sweet burn registers to my brain cells… I immediately pour the whole can down the sink in a desperate effort to control my raging desire to chug. Yes, I realize my actions are oddly similar to that of a drug addict. Yesterday, a wonderful woman and friend made homemade chicken pot pie. For me, chicken pot pie is bae heaven. When someone cooks pot pie and invites me to join in… I feel like they are indirectly professing their love for me. It is as if they are encouraging me to reminisce on my childhood in Louisiana, and those days after school when I used to cut a little slit in the top crust of frozen pot pies, and patiently wait until the described “golden brown” on the package was reached. They want me to go into my old TV room, turn on Saved by the Bell, and eat the crust from around the gooey center. AND I TOTALLY DIG THAT. I think that’s where my weird love for food stems from. It’s not about specific tastes or smells or cravings. It is about the past that comes barreling through my kitchen when I fix a bowl of pistachio ice cream or make a fresh cup of Community Coffee. I relate everything to my family, and the people I love. Which is obviously crazy unhealthy and ridiculous. Because I cannot very well eat in hopes of bringing those moments back. Still, I will continue to try like hell. Now, if you’ll excuse me, I have a cup of PG tips and thoughts of my Uncle Jim’s Scottish dialect waiting for me.